Planning a litter 2017 / 2018! By origin the Lapinporokoira is a shepherd of the reindeer. 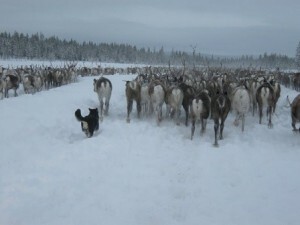 The people of the Saami used these dogs for multiple purposes. They had to look after their reindeers, Run in front of the sleds, guard valuable possessions and they had to keep their children warm. they still use this breed for these purposes in Scandinavia, but they are also very efficient for hunting and rescue. It’s an independent dog that likes to work. The Lapinporokoira is suited for many kinds of dog sports, if you are able to keep the dog motivated. Variety and a positive approach are the best ways to maintain motivation. Even though this dog has an average size and a friendly appearance, it should not be underestimated. They are very smart and able to fool you with their humor and tricks, they should be raised with consistency and strict rules but never with an aggressive approach. A thing to keep in mind is that this breed can bark a lot and should be guided with good care. With the right treatment it’s possible to train the dog to know when it is and when it isn’t allowed to bark. Do not expect a slave for a dog with the Laponnian Herder. They are prepared to work for you if you show them appreciation and keep them motivated. You will have a friend for life. This dog will give you company, but if that is the only thing you are looking for then it’s best for both to look at another breed. They will become unhappy when they don’t have a task or goal and should be kept busy. Being a social dog needing to be around people makes it automatically an unfit breed for people with a full-time job. It’s okay to leave them alone for a few hours but after that they will be needing social interaction (just like any other breed). This breed still stands close to nature and also behaves like that. With this breed you will encounter characteristics like compassion, independence and being a real problem solver. They are also capable of noticing other dogs behaviour, they will quickly know the other dogs mood and react to it. During the moulting period, usually twice a year, they will lose a lot of hair. Besides that it’s a fairly easy dog to maintain which can become quite old. There are very few health problems, but the ouderdieren their DNA needs to be tested on PRA and they need to undergo an ECVO eye-test. An HD test isn’t obliged but necessary in my opinion.